Raiders edge defender Shilique Calhoun is about 20 pounds heavier than he was in 2016 according to Eddie Paskal on Raiders.com. Oakland drafted Calhoun in the third round in 2016. Calhoun played 172 snaps in 2016 before a knee injury ended his rookie season. His overall PFF grade of 46.8 ranked 133rd out of 155 edge defenders. 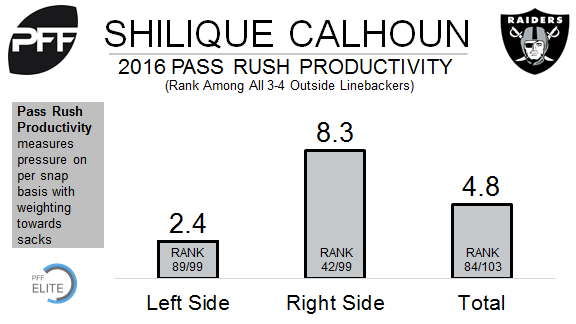 Calhoun had one sack, two QB hits, and one hurry in 68 pass-rush snaps in 2016. The added weight might improve his run defense, as he made only two stops (plays graded as a “loss” for the offense) in 75 snaps against the run.